While the President of France was sending a message about the destructiveness of nationalism during the Paris ceremony commemorating the end of World War I,1)2) in Warsaw a quarter of a million of people held the annual Independence Day March, Europe’s largest patriotic demonstration. The contrast between the two events shows how far Europe is from the ideals that once constituted the strength of the Old Continent, i.e. faith, family, nation and homeland. 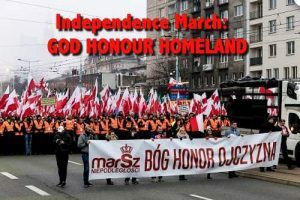 Polish citizens generally take great pride in their national identity, and that is precisely what almost all European and overseas mainstream media dislike intensely. It is in line with this feeling that reports on the Independence March are made in such a way as to fill the Western readership, listeners and viewers with disgust and cause a feeling of shame among Poles. As it is, the authors of these articles have all attributed to the Warsaw event a fascist and Nazi character, creating an equality between these ideologies and nationalism, without thinking about the history of the country they are writing about. European politicians use the mainstream media as a mouthpiece through which bureaucrats in Brussels define what is acceptable and what is not. The Western recipient of this virtue signalling is clueless about the reality because mass media are still credited with being independent and reliable. The interpretation of the information becomes dogma, which should not be questioned. The mass media that do not toe the party line and which are thus forced to operate on the fringes of society are maliciously termed as populist, right-wing (with the notion of “right” invariably being accompanied by the adjective “far”), nationalist or fascist. Such are – yes, you know it all too well – the National Front in France, Law and Justice in Poland, the Northern League in Italy or Fidesz in Hungary. It was the media that created the impression that the otherwise neutral terms, such as populism or nationalism, from the notional vocabulary of political and sociological sciences are now perceived as extremely negatively charged, and it so happens that the European elites are striving to rid themselves of their opponents by calling them names using precisely these appellations. This year’s reports on the Warsaw Independence March, which was held on 11 November, were as usual glaringly skewed, biased and tendentious. The average reader is conditioned to perceive Poland as a country full of aggressively-minded people – “fascists” and “Nazis”– and the event itself as extremely dangerous. The authors of these reports either do not know the history of Poland – because if they did, they would select words with greater care – or they are misleading the public purposely and painting a distorted picture of reality. Brussels is busy trying to suppress religious faith, national identity and national heritage, so as to uproot Europeans. Last Sunday showed that Warsaw and the European establishment couldn’t be farther from each other.